Service Specific Scheduling: If you have specific pet grooming services that can only be performed by specific employees or in specific facilities, you can toggle on GroomProPOS’s service specific scheduling option. You can limit which calendars each service are bookable on, so GroomPro will automate and save you the headache. New employees will never be confused when booking new appointments, as GroomProPOS will not allow them to book a service on an incorrect calendar. To learn more about GroomPro's service specific scheduling feature view our "How To" article. Click 2 Call: Why use your antiquated phone system when you can call customers from your business line with the click of a button? GroomProPOS has introduced "Click 2 Call" features that enable outbound calling directly through our software platform. Every call will be recorded and documented in the system as well, for easy access in case you forget details about your pet grooming appointment you just set up over the phone. To learn more about GroomPro's Click 2 Call feature view our "How To" article. Cash Management Controls: Using GroomProPOS cash management control, you have full ability to keep track of the cash and check transactions keeping responsible every employee who handles money within your pet grooming business. Looking to easily organize, but skip the drawn out closing process? Are you a small, or owner-operated business? Well, GroomPro makes it easy for you to turn these Click here to learn how to toggle these settings on and off. Adjust Ledger Using Credits: Some of your pet grooming customers may have credits applied to their account from gift cards or other similar scenarios. If you have a customer with a balance due on their invoice ledger, GroomProPOS now allows you to use any unapplied credits that they may have to adjust the invoice balance. This saves time that you may have spent trying to track down a customer for payment, while at the same time keeping the bookkeeping in order. To learn more about applying credits to satisfy a customers ledger, view our "How To" article. Record External Transactions: GroomProPOS customers get the most out of their experience when they are able to utilize the software throughout the entire flow from booking to payment to review requests and further. Don't use GroomPro for credit card processing? Use an external terminal to check out your pet grooming customers? Not a problem! We have introduced the ability to log credit card transactions in our system even if you are using an external credit card terminal. This means that you now can keep accurate tabs on your pet grooming business' revenues and expenses even if you don't use our software for processing. Click here to learn how to toggle these settings on and off. Low Inventory Notifications: Keeping track of inventory is only one of the many responsibilities of pet grooming business owners. When handling your day to day business needs, it may slip your mind to check your inventory stock every single day. With GroomProPOS you can set low inventory alerts. Under your GroomPro inventory management settings, you can set a specific quantity and you will be alerted when any product hits that level. This reminds you to put in a purchase order before you run out. 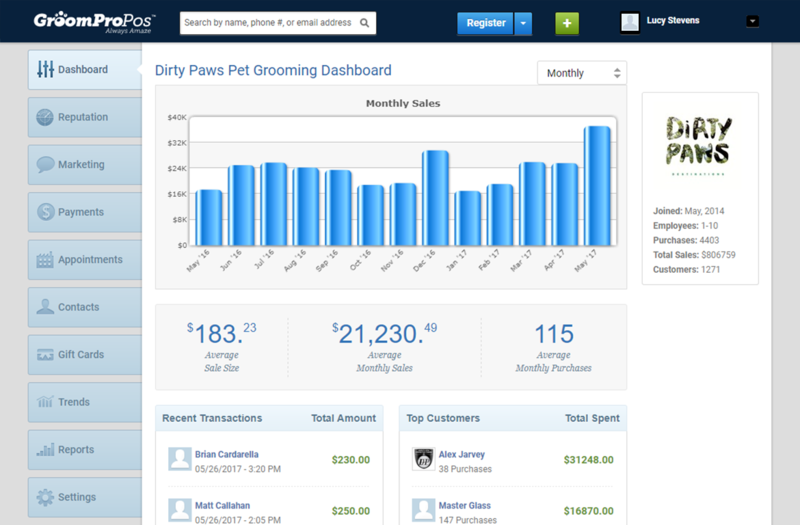 Inventory Reports: Keeping accurate tabs on your pet grooming product inventory is essential to maximize profit margins. Having too much inventory sitting in stock can cause a loss in profits due to expired products, and running out of inventory limits the number of sales you can possibly make. With our technology, GroomProPOS can accurately keep tabs on the amount of inventory you have on hand. With our very friendly user interface, GroomPro makes keeping track of product quantities a problem no longer! "How To" article.